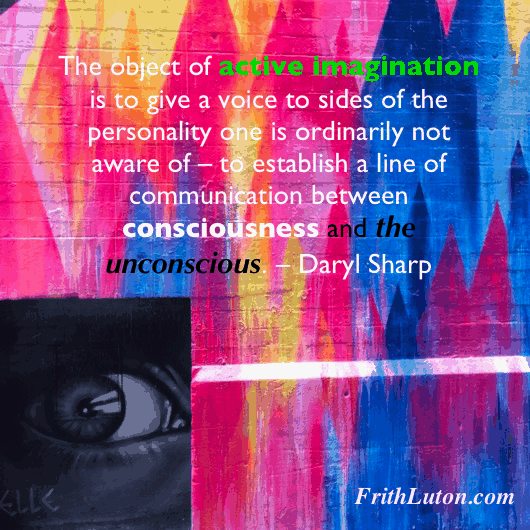 Becoming conscious of one’s fantasies, otherwise known as active imagination, is a useful activity for tracking what is going on in the unconscious. It is not generally recommended for those not in analysis because what comes up may not have a pretty face and can in fact be quite scary. Also, perhaps fortunately, active imagination is not easy to get into. Active imagination can involve painting, writing, music, dance, working in clay or stone—whatever you feel like doing. You follow your energy where it wants to go. The less formal training you have the better, because the trained mind inhibits freedom of expression. It is a way of giving the unconscious an outlet, so you don’t explode. It is also another kind of container; instead of dumping your affect on other people you keep it to yourself—you take responsibility for what’s yours. Speaking for myself, I was unable to do active imagination until a friend suggested some simple steps. The first of these was aimed at overcoming my fear of a blank sheet of paper. This was wily advice because, as I later learned, any circular image is in effect a mandala, and mandalas are traditionally, that is to say archetypally, containers of the mystery. At the time I certainly needed a container, and everything was a mystery to me. Before long my walls were covered with images of my inner life: gaudy mandalas, stick figures, fanciful doodles, depictions of a mood. I graduated from newspaper to cardboard to good quality bond. I used whatever came to hand: pencils, pen, paint, felt-tipped markers, fingers, toes, my tongue! All crude reflections of whatever was going on in me when I did them. They had no style or technique and people who came to visit my hole-in-the-wall apartment looked askance. When I come across them now they do seem grotesque, but at the time I loved them and my soul rejoiced. Jung said very emphatically to this voice that his fantasies had nothing to do with art, and he felt a great inner resistance. Then came the next assault, and again the same assertion: “That is art.” This time I caught her and said, “No, it is not art! On the contrary, it is nature,” and prepared myself for an argument. When nothing of the sort occurred, I reflected that the ‘woman within me’ did not have the speech centres I had. And so I suggested that she use mine. She did so and came through with a long statement. Intrigued by the fact that a woman could interfere with him from within, Jung concluded that she must be his ‘soul,’ in the primitive sense of the word, traditionally thought of as feminine. The object of active imagination, then, is to give a voice to sides of the personality one is ordinarily not aware of—to establish a line of communication between consciousness and the unconscious. It is not necessary to interpret what the material ‘means.’ You do it and you live with it. Something goes on between you and what you create, and it doesn’t need to be put into words to be effective.